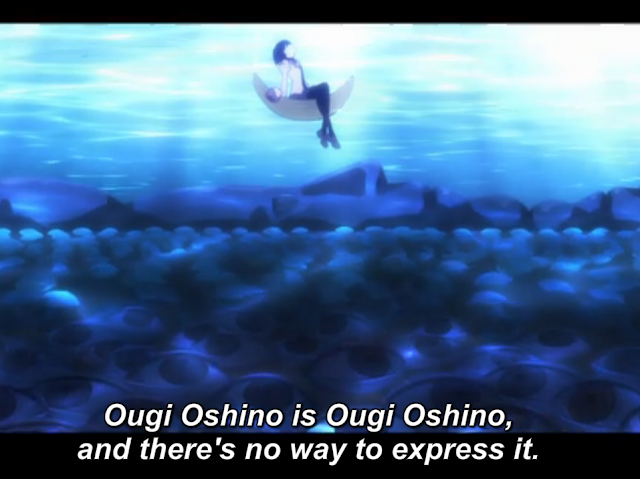 Summary: During October of his third year in high school, Koyomi Araragi is introduced to a transfer student named Ougi Oshino by his underclassman Kanbaru Suruga. Ougi tells Koyomi that she has something she wishes to consult with him. When she draws the map of Naoestu High School, she finds something peculiar on the map of Naoetsu High School she draws. This discovery reveals a tale that wasn’t meant to be told, and this makes Koyomi’s high school life totally different. This is the story that brings to light “what” makes Koyomi Araragi. This is the story that reveals the “beginning” of everything. At the same time though, there's something I just love about her character. Something is incredibly...off...about her, but I love the character. Those eyes though. Oooh, *shiver*. My Opinion: It's more from the Monogatari series. That should be all you need to know. If you were already watching, continue to do so, if you haven't started watching, you need the previous seasons in your belt first. No really, what the hell is wrong with you if you watch this first? You will understand literally nothing.